This invention relates to a novel molecular based method that enables the screening of twin-to-twin transfusion syndrome (TTTS), in a fast and non-invasive way. This method relies on the quantification of a specific biomarker gene expression on maternal plasma /Figure 1). 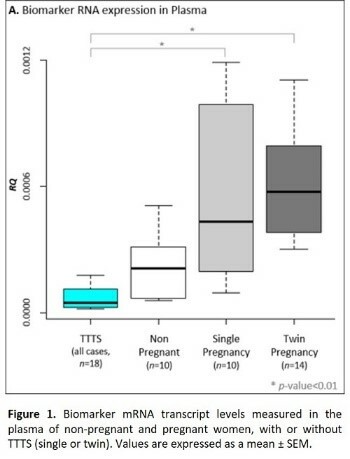 Therefore it is proposed as a screening tool for TTTS that will eventually contribute to an antecipation of the diagnosis and consequently to a substantial decrease of the underlying fetal mortality and morbidity. This is a fast and non-invasive molecular-based method. The method may antecipate the diagnosis and allow a more timely treatment and consequently greater probabilities of survival of both fetuses and decreasing sequelae in survivors.